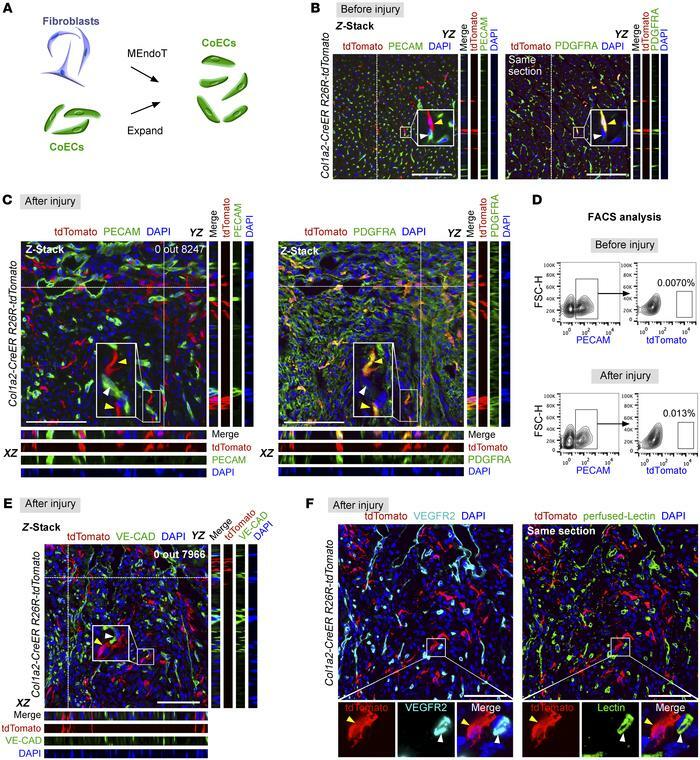 COL1A2+ fibroblasts do not adopt the endothelial cell fate after injury. (A) Models explaining new vessel sources: MEndoT and self-expansion. CoECs, coronary endothelial cells. (B) Z-stack confocal images of heart sections stained for tdTomato, PECAM, and PDGFRA. Col1a2-CreER R26R-tdTomato mice were treated with tamoxifen 2 weeks before analysis. YZ indicates signals from dotted lines on Z-stack images. Yellow arrowheads indicate PDGFRA+tdTomato+ fibroblasts; white arrowheads indicate PECAM+tdTomato– endothelial cells. (C) Immunostaining for tdTomato, PDGFRA, and PECAM on sections of postinjury hearts. tdTomato+ cells express fibroblast marker PDGFRA+ (yellow arrowheads), but not endothelial cell marker PECAM (white arrowheads). (D) Flow cytometric analysis of percentage of PECAM+ endothelial cells labeled by Col1a2-CreER transgene (tdTomato+). (E) Immunostaining for VE-CAD and tdTomato on sections of injured heart. tdTomato+ cells (yellow arrowheads) are close to, but were not identified as VE-CAD+ endothelial cells (white arrowheads) in the injured heart. (F) Immunostaining for VEGFR2 and tdTomato on heart sections perfused with FITC-labeled BS1 lectin. tdTomato+ cells (yellow arrowheads) are not VEGFR2+lectin+ vascular endothelial cells (white arrowheads). Scale bars: 100 μm. Each image is representative of 4 individual hearts.